Appearance: Saki is generally considered a rather beautiful girl. 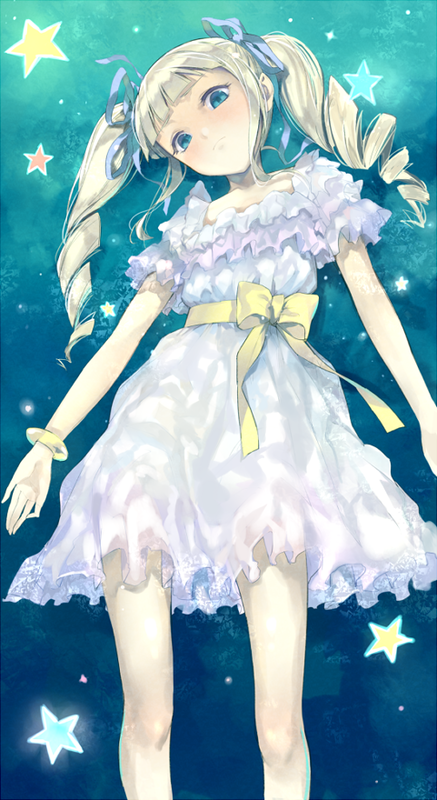 Frail and pale with blue eyes and very pale blonde hair, some would compare her looks to that of a doll. She looks too fragile to touch in a lot of ways. Her body is still quite childish and underdeveloped, standing at just about 5 feet, no more no less. She has a bit of a complex about her chest. She takes great pride in her looks, and is always wearing makeup. Her hair is generally tied back into a twin tail style, usually painstakingly curled. For clothes, Saki is a snazzy dresser. She keeps up with the latest in fashion, though she prefers dresses and skirts to pants, as they can get somewhat painful on her legs on a bad day. Even though she spends most of her time in a wheelchair, she still enjoys wearing high heels. She needs glasses, but typically wears contacts. Backstory: Saki was one of those girls that was born with a proverbial silver spoon in her mouth. Her parents were filthy rich, and as the only child they were able to have she was destined to be excessively doted on to distraction. She had a very warm and close relationship with her parents. Whatever she wanted, she would usually get. Her father and mother are often the only people she really feels comfortable confiding in. For Saki, trusting can be hard, but she knows her parents always have the best interests in mind. This stems from her experience in her early schooling. Her parents knew she was smart, so they spent heavily to send her to only the finest in schools. It might sound excessive to worry about elite schooling at such an early age, but Saki's mother refused to budge on that. Saki though was a bit too smart of her own good. Used to getting her way, she clashed repeatedly and often with her classmates. Even among the elite, intelligence often leads to isolation. For Saki it was no different. Her mind just worked on a different level. She had a hard time understanding her peers, especially since her spoiled upbringing had made her feel rather superior to everyone. It didn't help that she was an only child either. There was no sibling to practice getting along with, only a variety of cousins and relations in Japan and overseas that she visited every so often. She never saw them enough to really get close. When someone is as standoffish as Saki is, it’s hard to get her to open up. Still, life was good. Even if she wouldn't admit that she was a little lonely. Saki had a lot of acquaintances, but very few friends. Much of that was her own doing thanks to her belief that she is always right. Of course, the few friends that she did have she was really close with. They came from families of a similar pedigree. But even more importantly they were the kind of girls that Saki felt could keep up with her. As a type a overachiever, Saki always felt a need to compete. In academics she was always the top. She was even briefly the Student Council President of her middle school. These friends of hers were never far behind. If she’d take the top grade, they’d be two and three. Their names were Akane Tatsuko and Hoshiyama Haruko. They joined many of the same clubs. Together they all took their tennis lessons, and even the classic art of self-defense for a proper Japanese lady, naginata. They were good times that Saki definitely looks back on fondly. There was even a boy that she liked. The son of an acquaintance of her father that they routinely summered with on Okinawa. Alas, poor Saki not the kind of girl to be honest with her own feelings. So she never really got a chance to express how she felt. Since tragedy struck before she could work up the guts to say what she felt. Not that she ever would admit it, but she regrets it to this day that she didn’t speak up. There’s no way she could do it now. Unfortunately for Saki, a lot of the dreams that her parents had for were not to be realized. At the start of middle school, she was struck down by a then, and still relatively unknown disease. It attacked her nervous system, leaving her with nerve damage. To this day she suffers from pain, and is stuck in a wheelchair most days. Her body is weak, and walking is painful. Despite the attentions of the world's finest doctors, there seems to be no cure. The best they can offer Saki is pain management, and physical therapy. Unfortunately for her classmates, the pain leaves her quite easy to anger. It also left her much more alone than before. As prideful as Saki was, she decided from the start that she’d never let her friends see her in the pitiful state she is in now. She wanted them to remember her as she was in her prime. So she cut them off. It wasn’t easy, but Saki couldn’t stomach the idea of them seeing her like this. It was hard. Saki could no longer do many of the things she once enjoyed. Tennis was quite hard to drop. Her hobbies now took on a more sedentary bent. Reading, and video games were of increased performance. Not that she’d ever admit it, but she enjoys the games because for even a moment they let her forget about her weakened body. In the game she can run, jump, and even fly as if nothing had ever happened. Saki’s illness led to more than just changes for her. In his dedication to Saki’s recovery, her father neglected his work at the Ishimura conglomerate. As a consequence they sent him to less an important market across the sea in Canada. Now that’s where Saki calls home. Her parents enrolled her at Tachibana, thinking it would be good for her to be an environment with students who had undergone a similar plight. Personality: The first words that come to mind to describe Saki would be a tsundere. She's quite spoiled, and is used to getting her way in all things. After all, her parents were not one to deny their little angel anything. Her demeanor though is anything but angelic. Quick to anger and with a harsh tongue, she's never been the type to make friends easily. While she's quick to snap at anyone for any perceived slight, when it comes to her own feelings she finds them hard to discuss. Especially where her own conditions are concerned. It's a real shame, that her personality keeps from realizing just how bright she could be. Saki claims to be interested in studying. But the truth is that academics have always came easy to her. Her body might be frail and underdeveloped, but her mind is not. Her favorite thing outside of school though has to be video games. It allows her to free from the prison that she feels is her body on most days. She's quite good, and has quite the reputation on there. Again, it isn't a good one though.